What makes a real hero? Let’s dissect a couple and see what we learn. Well in Armageddon Empires it boils down to Command Rating, Fate and Special Abilities. There are some other factors to consider but those are the three that will basically determine how you employ each hero. Why do you even need heroes? Well to start with you can’t form any armies greater than your faction’s Base Command Rating without taking a significant penalty to each unit’s attack and defense. A Hero with a Command Rating of 8 will let you fill up all 8 slots in an army and they will fight with out a command rating penalty. If you exceed the Base Command Rating of a hero-less army or the Command Rating of a hero led army then for the first unit over, the penalty is -1 to each unit’s attack and defense and an additional -1 for every two units after that. Penalties like those can cripple an army in short order. Also losing your hero in the middle of the wasteland can be a very “bad thing.” When you go into battle and the enemy has a unit with the Sniper special ability, it might be a good idea to take it down first. Each hero also has a Fate attribute. This ability denotes the number of times a hero can influence a die roll during an event in which he or she is participating. It effectively lets the hero re-roll a single die for each point of fate. For example a unit in the hero’s army comes under attack. The die are rolled for the enemy attack versus the unit’s defense and then compared. Each 6 sided dice has 3 sides that denote success and 3 that denote failure. After comparing rolls it is determined that the unit is down by 1 success and 1 fate point is then spent to re-roll 1 of the unit’s failed defense die. The re-roll results in a positive so no damage is applied to the defending unit and it escapes without harm. Fate points can be spent on almost any die roll situation in which a hero participates….combat attacks, assassination attempts, sabotage and espionage attempts and even technology card creation attempts. Special abilities provide the extra flavor for each hero and go a long way to defining their roles. Some abilities are great for heroes that directly lead combat troops. There are special abilities that provide armies with a range of advantages from extended supply lines, movement bonuses, and positive modifiers to attack and defense to enhanced reconnaissance and initiative bonuses in battle. 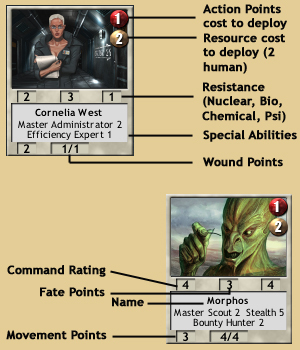 Several special abilities allow some heroes to create technology and tactics cards at their faction’s laboratories and war colleges respectively. Besides the big three there are some other factors to consider. A Hero’s movement rate will determine whether he or she can keep up the army or drag it down. An army’s movement rate is determined by the slowest unit in it, so a hero who is more of a researcher and has a movement point rating of 1 will severely limit the army’s movement. It might be best to keep that hero at your HQ and find other ways to use it. Resistance indicates how well a hero or unit can withstand unconventional damage like nuclear radiation, biological, chemical, mutagenic or psi weapons. These types of attacks are usually applied as extra damage after a successful battle attack and they are negated to some degree by the defenders resistance rating. The resource cost simply indicates how many and what type of resource units must be expended to deploy the hero. Heroes or units can only be deployed from the players hand to a location that has a facility or unit with a “barracks” special ability. Strongholds and Outposts implicitly have the “barracks” special ability but some rare units can possess it as well. Action points must also be expended to deploy a hero or unit. Usually the cost in action points is one half the total number or resource units rounded down. Wound points indicate how tough a hero is to kill and are the equivalent of a unit’s hit points. When a hero takes damage from a capture kill attempt, assassination attempt, or sniper attempt then the difference between the attack and defense die rolled is applied as damage (minus any applicable special modifiers) to the hero’s wound points. When the wound points reach zero the hero dies. Finally there is another special bonus that hero’s impart to any army (except a garrison) which they lead. Armies can only gain experience points if they are led by a hero. Experience points increase the fate available to a hero led army as successive experience ranks are reached as well as lessen the penalties for being out of supply. Executive Summary: Heroes play a key role in Armageddon Empires and can make a huge difference in whether an army wins or loses a battle. To win the game you are going to have to use your heroes well. This entry was posted on Thursday, June 15th, 2006 at 4:13 pm	and is filed under ArmageddonEmpires. You can follow any responses to this entry through the RSS 2.0 feed. Both comments and pings are currently closed.